We just closed on a new home… that neither my husband nor I have ever seen in person. Of course, it's not recommended to buy a house you've never visited. But sometimes, military life doesn’t accommodate traditional home buying methods. In fact, military families are often challenged to go home shopping in one state while they are living in another. The good news is that you can complete the entire home buying process from a distance without ever scheduling a plane trip to your new location. While I must emphasize that it is recommended you visit a property before making a purchase, this post will show you the steps needed to buy a home from afar. Typically, service members with PCS orders are granted several days of househunting leave to visit potential homes at their future duty station. It's preferable to use this time to schedule multiple home visits, so you can see a variety of properties in one weekend. However, there are many reasons military families may need to buy a home when the service member is unavailable to visit. In that situation, I recommend using a military friendly Realtor. There are directories and referral programs through MilitaryByOwner, USAA, and several other military companies. These Realtors are familiar with military family situations and used to processing requests or paperwork over a distance. When you find a home listing you like, they can schedule a “virtual tour,” where the Realtor visits the home and does a video call to show you around. They can also upload a tour to YouTube if the time zone distance makes scheduling difficult. This way, you can walk through a potential property, see it from all angles, and ask questions about the home. There is a LOT of paperwork that goes into the home-buying process. For several weeks, you will be in constant contact with your agent, your mortgage company, insurance companies, local utility companies, and your bank. The good news is that in the modern era, all paperwork can be signed electronically and processed through emails or online accounts. The downside is that both you and the service member will need to have reliable internet access to electronically sign all your documents. This can be difficult to arrange during deployment. In that case, the service member may need to sign a Power of Attorney so the spouse can sign paperwork in their name. If you attempt to buy a home this way, make sure the spouse is prepared to spend time daily responding to phone calls and emails. Buying a home may feel like a part-time job for a little while! It is strongly recommended that you visit the home in person at least once before completing your purchase. If you can only make one visit, it is preferable to do this during the home inspection process. On that day, a certified inspector will spend several hours walking through your home and making detailed notes about the quality of all home systems. If you are not present, your Realtor can attend for you, and you will receive a report with photos afterwards. However, if you can be there, the inspector can give you valuable information about the “guts” of your home—how the heating and air systems work, when to clean your furnace, recommended upkeep, etc. Not all this verbal advice will appear in the report afterwards. If you can’t be there, asking the agent to take some short videos of the inspector is one compromise that will allow you to benefit from the inspector’s advice. Often, a home inspection turns up new problems or areas in need of repair. If you have family members or trusted friends living near the home, you may schedule a visit to get their feedback about potential repairs. They may be able to visually verify something that was unclear on the inspector's report. As a buyer, you have the option to request that the seller address these concerns before closing. Alternatively, you can ask for cash back at closing to address needed repairs. The strength of your negotiation depends on numerous factors, including the seller’s asking price, their desire to close quickly, your original offer, and the current home market in that area. If you're unsure about what repairs to request, consult your Realtor for additional guidance. If you're not present to oversee repairs, make sure that your Realtor is staying closely involved in the process and communicating progress to you. Get all agreements in writing. In traditional home buying practices, both the seller and the buyer should be physically present at closing. Both parties sign legal paperwork, witnessed by lawyers. The seller hands over the keys and the deed to the property. It is possible to close without being physically present, but it will require some prior planning. Depending on your bank, you may have two options for a long-distance closing. One option is to designate a Power of Attorney, so that a local individual (a trusted family member or friend) can sign the closing documents for you. You cannot designate this authority to your Realtor. If you can attend but your spouse cannot, you will need to get a Power of Attorney so you can sign for them. Discuss this with your bank ahead of time so they can approve it and prepare the right documents. A second option is to complete the closing through a third party title company local to you. Both the buyer and seller will sign closing documents on the same day; you will just do it at different locations. The seller will sign at a lawyer’s office near the property. You will sign in front of a Notary at a title office near you. Again, you must discuss this in advance with your bank and get approval to use an outside title company. Depending on the method you choose, keys can be mailed to you, given to a local family member for safekeeping, or stored in a lock box on the property. Make arrangements with your Realtor so there is no confusion about where to send the keys. As you can see, buying a home from afar can be a complicated process. But it is possible! 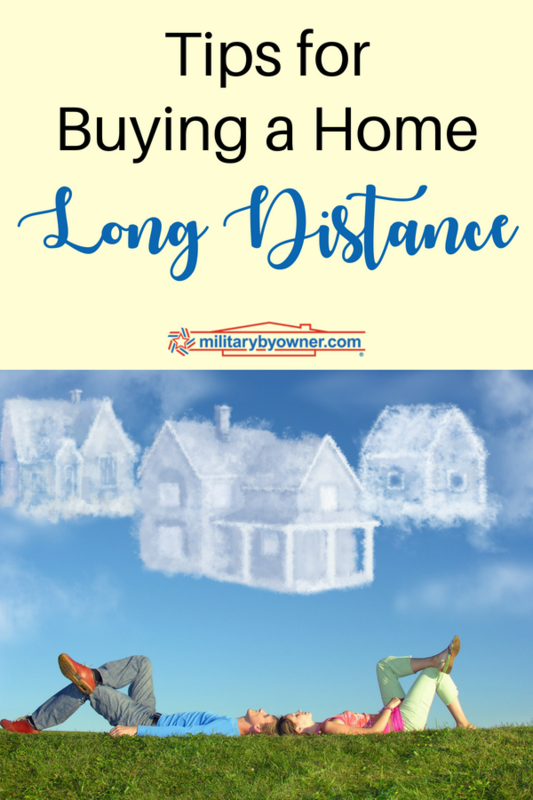 For military families who are unable to travel ahead of time, use these tips to help your home-buying process go smoothly.